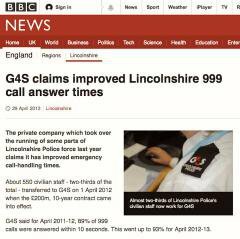 Three years ago the security company G4S boasted that it had radically improved emergency call handling times for Lincolnshire Police. 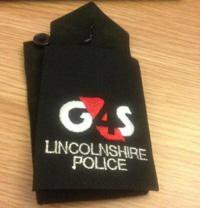 Today G4S admitted that it had suspended 5 members of staff working with Lincolnshire Police “following an investigation led by the force with support from G4S”. Again John Shaw popped up, this time to reassure the public: “We have suspended 5 employees today and have taken swift action to begin our investigation process,” he said. Should the public trust G4S and Lincolnshire police to investigate? The pair are commercial partners in a groundbreaking outsourcing contract, worth £200 million over ten years. Just a few years ago G4S and its competitor Serco were caught cheating the public purse out of tens of millions of pounds on electronic tagging contracts. And the “world’s largest security company” has a long history of blaming rogue employees for corporate wrongdoing. After G4S cooked a prisoner to death in the back of an overheated van in Western Australia in January 2008, the company tried to lay the blame on two detainee custody officers. G4S and other outsourcers use performance figures to push the case for outsourced public services. Today’s revelations suggest that every one of G4S’s performance-related claims should be subjected to renewed, strict and independent scrutiny.